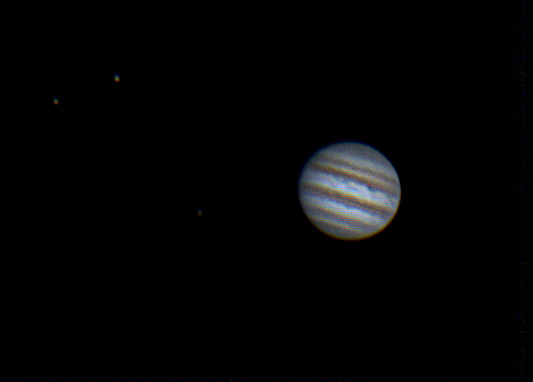 Swansea Astronomical Society Blog: Jupiter with Callisto, Ganymede and Io. Jupiter with Callisto, Ganymede and Io. Celestron 9.25 SCT AVX, ZWO ASI120MC-S camera, 8151 images captured in Firecapture, 1000 stacked and aligned in AutoStakkert!2.3, wavelets in Registax 6, then edited in Adobe Elements 11.